Passion meets purpose in our personal injury practice area. Clients call on Weissman attorneys for a wide variety of personal injury matters. We believe that our experience on both sides of the claim gives us a unique ability to analyze, evaluate, and litigate for our clients. From the plaintiff’s side, we understand that when someone has suffered an injury it can affect every aspect of their life. 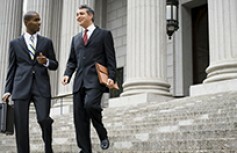 Our attorneys handle all matters with the utmost sensitivity, realizing each client and situation is unique. Because our client’s best interest is the most important aspect of our representation, we review and investigate the facts to realistically evaluate a case and present potential outcomes. We work with our client as a partner and guide in reaching the most beneficial outcome for their case. From the defense side, we understand that a claim can have impact on our client in ways other than just a possible negative verdict. We believe in early evaluation and a cost benefit analysis of the case, keeping in mind the potential outcome and the litigation expenses involved. We tailor our handling of the case to meet the individual needs and objectives of our client in each specific situation. Our goal is to deliver the best possible result in the most efficient and cost effective way, whether that means taking the case to trial or negotiating a settlement.